The pioneering entrepreneurs behind a state-of-the-art centralized hospitality laundry in India have chosen Milnor to partner them in their quest for excellence. Over the past century, India's traditional laundries, called Dhobi Ghats, have grown from open-air, hand-washing basins employed by thousands for their laundry needs to full service operating plants. 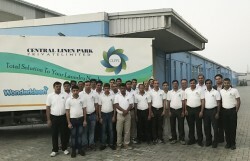 The next generation of laundries in India is epitomized by Central Linen Park Private Limited (CLPPL), the largest, state-of-the-art hospitality laundry in the country. What makes it state-of-the-art? 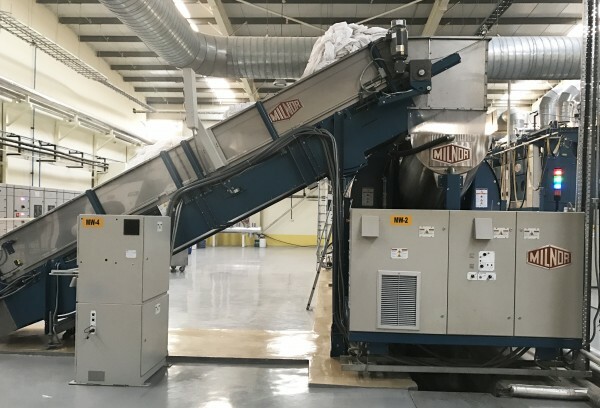 Owners Surendra Ruia and Arun Saraf explain that this is due to a combination of its design, which can challenge any international centralized laundry around the globe, and the full line of Milnor equipment that has been running since August 2016. Before last year's installation, Mr. Saraf was already one of the leading hoteliers in India and Nepal with nine 5-star Hyatt hotels, each with an independent in-house laundry in operation and several more in the planning process. 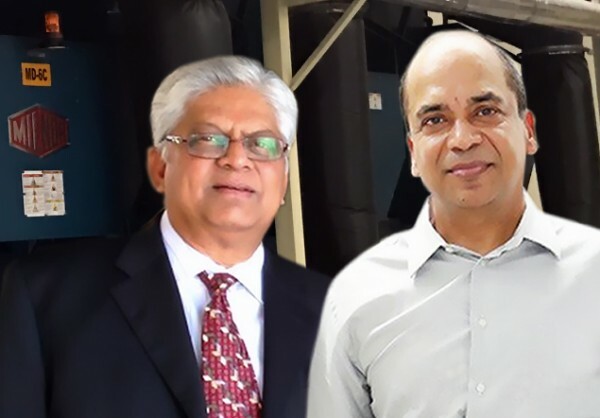 Adding to his laundry empire, Mr. Saraf worked alongside Mr. Ruia, chairman of Central Line Park Private Limited; Suresh Goyal, managing director of Supershine Laundry Systems; and Thierry Lambermont, managing director of Milnor International, to turn the idea of one off-site facility into reality. Choosing Milnor equipment was an easy decision for the group, as each of Mr. Saraf's nine in-house laundries ran Milnor equipment that exceeded expectations. "Milnor machines are definitely the best bet for any laundry set-up, whether in-house or commercial in nature. They were observed giving the desired high quality output without requiring a lot of service and parts replacements," says Mr. Saraf. "The operating costs, including power, water, and steam consumption and subsequent total ownership costs were lowest among different competing laundry manufacturers, helping to make Milnor CLPPL's preferred brand," adds Mr. Goyal. CLPPL prides itself on efficient laundry service that, according to Mr. Ruia, "is all about consistently delivering the highest quality in a standardized manner." After more than a year spent planning and building the facility from the ground up and six months in operation, CLPPL does just that. The 6,168 square meter plant, located in Delhi-NCR, now proudly features a four-pocket weighing conveyor, one 8-module 68kg (150lb) PulseFlow batch washer with one 68kg (150lb) single stage press and a two-cake shuttle system to best serve their customers. CLPPL also uses Milnor steam dryers, including four 64058TS with four MLF1010 lint filters. For smaller loads, eight washer-extractors, including two 18kg (40lb) 30015V7J, two 27kg (60lb) 30022V6J, three 63kg (140lb) 42026V6J, and one 125kg (275lb) 48040H7W, run during daily operations. 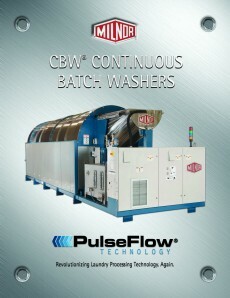 By incorporating Milnor's PulseFlow batch washer, CLPPL has gained efficiency in laundry processing by both increasing the amount of linen processed and reducing the overall labor required to unload washer-extractors and load dryers. Once linen from surrounding hotels arrives by company-owned trucks, the plant's 40 full-time employees operate one eight-hour shift, which produces approximately 5.44 tonnes of hotel linen per day. However, Mr. Ruia plans to nearly triple his labor over two shifts within the year, and expects the plant to successfully produce over 13,600 tonnes a year as a result. Additionally, the laundry is designed to expand with the growth of the industry, so that more equipment can be housed in the same facility to reach an annual production capacity of 27,200 tonnes. CLPPL has also seen notable reductions in water consumption. "Water availability and the subsequent effluent disposal," notes Mr. Ruia, "is critical but not very easy in India." 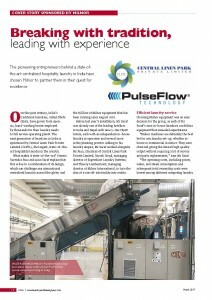 He credits Central Linen Park's efficiency to Milnor's PulseFlow technology noting that since the installation, water consumption has drastically reduced from 16l/kg to 3l/kg. CLPPL once merely existed as a vision to reshape the Indian laundry industry. Prior to being built, laundries for the Indian hospitality industry were primarily driven by the in-house laundry concept which provided hotel owners with limited exposure and access to laundry outsourcing. With the help of Milnor machinery, CLPPL has changed both the laundry and hospitality industries by bringing higher quality service and a better value proposition for mots hotels in the area. The success of this plant has motivated Mr. Saraf and Mr. Ruia to expand in the near future. They are currently planning to establish four new laundries in Mumbai, Bagalore, Chennai, and Hyderabad within the next three years, each operating with a production capacity of at least 13,600 tonnes per year and a provision to double the capacity at any point. "With Milnor's continued support," says Mr. Saraf, "we expect to have Milnor machines installed in all of our future laundries." With the growth of tourism and expansion of the hospitality industry, Central Linen Park's management team has a clear vision for the Indian laundry industry. If the current plant is any indication, the partners' vision is destined for success. PulseFlow® is Pellerin Milnor's registered trademark.